Art, like all things material, eventually decays. Yet, even in decay art is revered. Chards of glass, broken bits of pottery, limbless torsos are treasured as portals through which we can learn the spirit, aesthetics, and the value of other cultures. Even weapons long past their utility like the flintlock pistol, cannon, or arrowhead reveal something of their makers through design and decoration. Table And Chairs #3 was originally created for the College of Creative Studies Art on the Move project. The program supported installations of the same piece of art in a variety of locations so artists could experience the influence of environment on their sculpture. 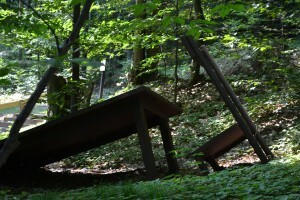 This art which now seems partially buried in the forest was once located on the lawn of the Detroit Institute of Arts. Imagine your response to Table and Chairs #3 if you were viewing it form the sidewalk along busy Woodward Avenue. To who did this furniture belong? How was it used? Why was it abandoned to decay? Was it abandoned or is it tipped over by an act of family violence? Does the location change the emotional content?